A processing and first-aid station in Key West, Fla. USCG photo. The year was 1980. Amidst growing dissent, housing and job shortages as well as a plummeting economy, Cuban Premier Fidel Castro withdrew his guards from the Peruvian embassy in Havana on April 4. This move should have served as an early warning to the United States of trouble brewing in Cuba, but the signal went unnoticed. Less than 48 hours after the guards were removed, throngs of Cubans crowded into the lushly landscaped gardens at the embassy, requesting asylum. Our hearts go out to the nearly 10,000 freedom-loving Cubans who entered a temporarily opened gate at the Peruvian Embassy just within the week, said President Jimmy Carter. But the Carter Administration insisted this was a Latin American problem and refugees were seeking asylum in Peru and Venezuela. Castro, an adept politician, could easily recall another similar incident  the 1965 Camarioca Boatlift. He seized that opportunity to offer several hundred thousand dissidents a rare chance to leave Cuba, and purged his country of those who spoke their minds. In 1980, a well-orchestrated opportunity once again lay at Castros feet. As the crowd at the embassy grew hungry, as babies became ill and water scarce, photos and stories of the crisis were disseminated throughout the world. Castro refused to allow any humanitarian organizations such as the International Red Cross to give assistance. The revolutionary regime in Cuba was growing nervous. By mid-April, Carter issued a Presidential Memorandum allowing up to 3,500 refugees sanctuary in the U.S. First priority would go to released political prisoners, second to members of families already in the U.S., and third to refugees seeking political asylum. The broad wording would be used by Castro to send just about anyone to the U.S.  including criminals and the terminally ill. Contending the U.S. should not shoulder the burden alone, Sweden, Peru and Belgium were among other countries offering asylum. Castros next move was unexpected. 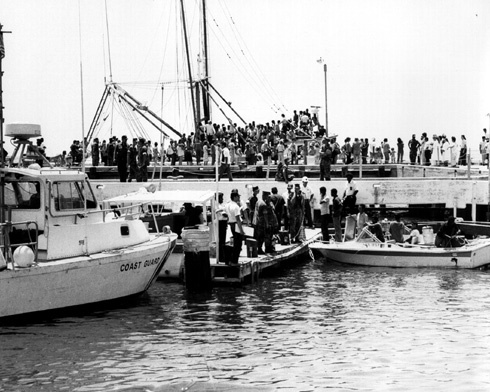 He announced to the Cuban-American community in Florida that if they came by boat to Mariel Harbor, they could claim their friends and relatives for transport back to the U.S. From dinghies to shrimp vessels and old wooden boats, the mass flotilla toward Cuba was an unusual and unexpected site, recalled CAPT Jim Decker, then commanding officer of the Cape York, a patrol boat assigned to Station Key West. 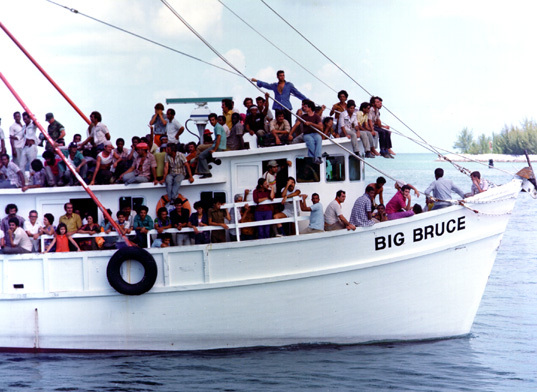 Cuban migrants arrive in Key West aboard the fishing vessel Big Bruce. USCG photo. Everything that floated was purchased in Florida, in hopes of getting to Key West and back, he said. Deftly manipulating all forms of mass communications including newspaper articles, television interviews, and even bullhorn announcements in the streets of Havana, Castro promoted the notion that everyone was free to leave. An article in Granma, the official Castro regime newspaper, announced the opportunity to leave the country. The call to those wishing to leave was unmistakable. But the Carter Administration was taken by surprise when on April 21, refugees started arriving on Floridas shores  their numbers would eventually reach 125,000. Meanwhile, Coast Guardsmen kept busy on long watches. They assisted boats that had run out of gas and rescued people from unseaworthy, overcrowded vessels. The situation intensified as the days wore on. By April 24, search patterns had been set up to effectively patrol the 90 nautical miles between Key West and Cuba. A furious storm of magnificent proportion, almost hurricane strength, came through, said Decker. When it ended, two of the boats Decker had been towing became lost, and one was capsized. Although the Cape York helped rescued those people, reports of bodies and boats floating all over the Florida straits were endless, said Decker. Well never know exactly how many people we lost during the entire boatlift, said Decker. The Coast Guard used international orange spray paint to mark the boats that had been contacted and people rescued, which allowed military aircraft to continue searching for others lost at sea. Still, as the weeks wore on, the flotilla arriving from Cuba burgeoned. Boats crammed with people dotted the watery landscape and the general tempo of the exodus increased. Many Cuban Americans paid often-hefty prices to operators of small boats to rescue relatives. By April 29, more than 1,700 vessels were reportedly in Mariel Harbor, awaiting processing of the refugees. To streamline the operation and preserve the safety of immigrants to the United States, the 7th Coast Guard District Commander, RADM Benedict L. Stabile, sent a telegram to the Cuban Border Guard requesting the names of vessels departing Cuba, and passengers aboard. The Cuban government ignored the request. By May, the Navy stepped in to assist the Coast Guard. Two Navy amphibious warfare ships arrived to help patrol the area. Each day, the Coast Guard conducted four air patrols augmented by the Navy. The Coast Guard took responsibility for the waters closest to Key West and to Cuba. Commander, 7th Coast Guard District, maintained tactical control, while RADM Warren Hamm, U.S. Navy, controlled the middle waters. Vigilantly monitoring the overloaded boats raised continual safety concerns. On May 7, ADM John B. Hayes held a news conference discussing safety concerns raised by the freedom flotilla. Hayes cited the Dr. Daniels incident, a tug that arrived in Key West with approximately 600 refugees on board with lifesaving equipment for only one-third of the personnel. Pointing out Cubas attitude toward the mass exodus could result in a maritime tragedy, he expressed his hope that the Cuban government would act more responsibly and in the interest of safety and humanitarianism. Coast Guard officials met with other involved agencies on May 10 to plan a strategy for handling humanitarian and legal issues raised by the relentless exodus. After that, the focus shifted from SAR to law enforcement. Using high frequency radio broadcasts, the Coast Guard announced it was illegal to transit in an unauthorized vessel and pick up people in violation of immigration and customs laws. Vessels with gross safety violations were escorted into port until violations were corrected. Commercial vessels carrying large numbers of aliens without visas were detained until collateral for fines was produced. Some relief did come on May 14 when Carter implemented a five-point program to impose order and decrease what were termed inhumane actions by the Cuban government. 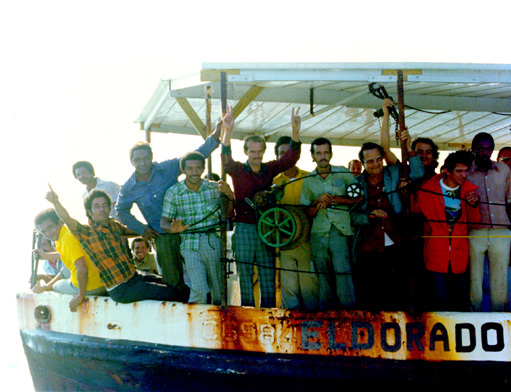 New boat trips to Cuba were prohibited and vessels already in Mariel Harbor were urged to return without refugees. The plan called for the U.S. government to arrange alternative transportation for Cuban citizens desiring to emigrate through an organized sea lift that would ensure safe and orderly transportation. All U.S. boats in Mariel and those en route to Cuba were advised to return to the United States without delay. Coast Guard boarding teams inspected returning vessels. Each team included a customs agent, an agent from the Immigration and Naturalization Service, and a Coast Guard investigating officer. However, all communications indicated that Cuban governmental officials would not authorize departure of vessels without refugees. There were stories about boats being escorted back to Mariel by Cuban boats because they had departed without refugees. Soon, boats overloaded with people began to reappear. Once again, the Coast Guard was called upon to assist with implementation of Carters five-point program. Marine broadcasts in both Spanish and English advised boaters to return to the United States. Although radio traffic was reportedly heavy, the exodus seemed to have slowed. Reports from Mariel were dismal. Refugees said the harbor had turned into a police state. At gun point, the vessel Atlantis was ordered to take 354 refugees with only 80 lifejackets aboard. The CGC Dallas responded to a call for help and escorted the fishing vessel to Station Key West. Migrants aboard the M/V El Dorado as they prepare to dock at the processing station in Key West, Fla. USCG photo. In early June, the Coast Guard Commandant requested and received presidential permission to call up reservists for up to six weeks. This landmark move seamlessly integrated the work of reservists, active duty and auxiliarists. By June 30, 600 Coast Guard Reservists had been called-up from throughout the nation. Many express satisfaction at having been part of this humanitarian mission. The Mariel Boatlift was the quintessential Coast Guard evolution. It was a multi-mission, high-tempo operation that included maritime safety, law enforcement, environmental management, humanitarianism and national security missions while relying upon every each working component. We learned how to pre-plan setting up resources, what indicators might arise to show another exodus might occur, and how to manage command and control of operations, said Decker. As Castro realized the international press had shifted attention away from the Cuban exodus and toward the United States, he began to send criminals, high-risk patients and the mentally ill to our shores. The INS detained prisoners, further straining federal resources. There is evidence that the Cuban government exported these undesirable elements to the United States in a calculated effort to support a propaganda contention that all of those Cubans who have come to this country are undesirable, said Carter in 1980. The state of Florida was especially taxed as the exodus reached a crescendo in 1980. Even today, lingering reminders of the Boatlift remain. Many Marielitos have become productive U.S. citizens  one even joined the Coast Guard for a stint. But the criminals and mentally ill patients Castro sent to U.S. shores was an unprecedented act by a Third World country. In 1987, at Oakdale, La., Cuban refugees set the Detention Center ablaze. Hostages were taken and Cuban prisoners at the Atlanta penitentiary repeated the scene as they set the prison ablaze and took 75 guards and employees hostage. More than 10,500 Marielitos were convicted of crimes  more than one hundred of them for homicide. Each time deportation of these particular Marielitos was negotiated, the reaction was severe including fires, rioting and the murder of hostages. But for the men and women of the U.S. Coast Guard, the Mariel Boatlift remains the most dramatic international event involving thousands of hours worked, the largest call-up of reservists in peacetime, and an extraordinary challenge on our U.S. Coast Guard resources. Eds note: PA3 Silverstein has been a freelance writer for the Tampa Tribune for three years. She also has a public relations consulting business and is a volunteer for the Mayors Public Art Committee and local Education Foundation.